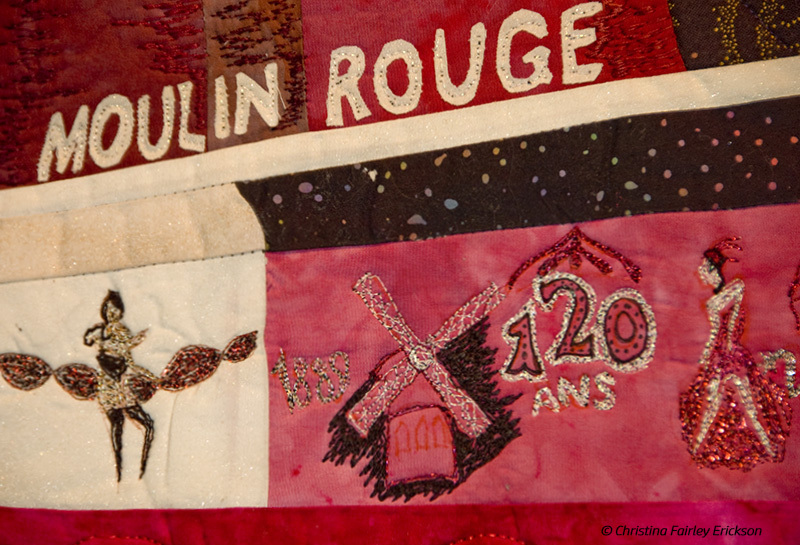 Since the late 19th century, the Moulin Rouge has been an inspiration for artists. 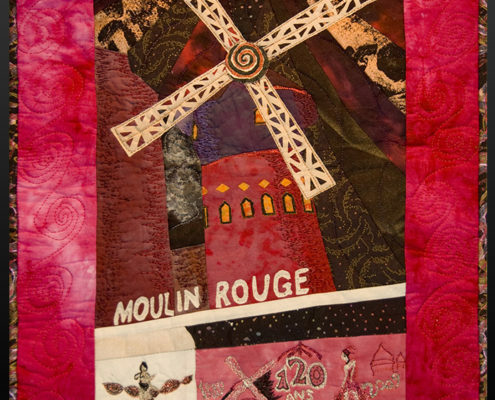 It has symbolized the bohemian lifestyle and served as a gateway to Montmartre, the neighborhood in Paris where writers, artists, and philosophers congregated. 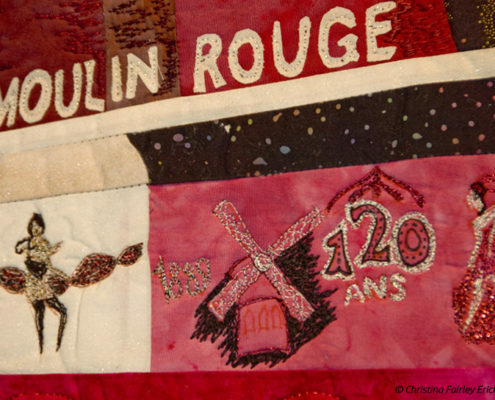 Most notably, Henri Toulouse-Lautrec captured many scenes of the Moulin Rouge in the 1890’s, helping to assure its fame through his lithographic posters. Most people are familiar with the Can-Can, a dance popularized at the Moulin Rouge. 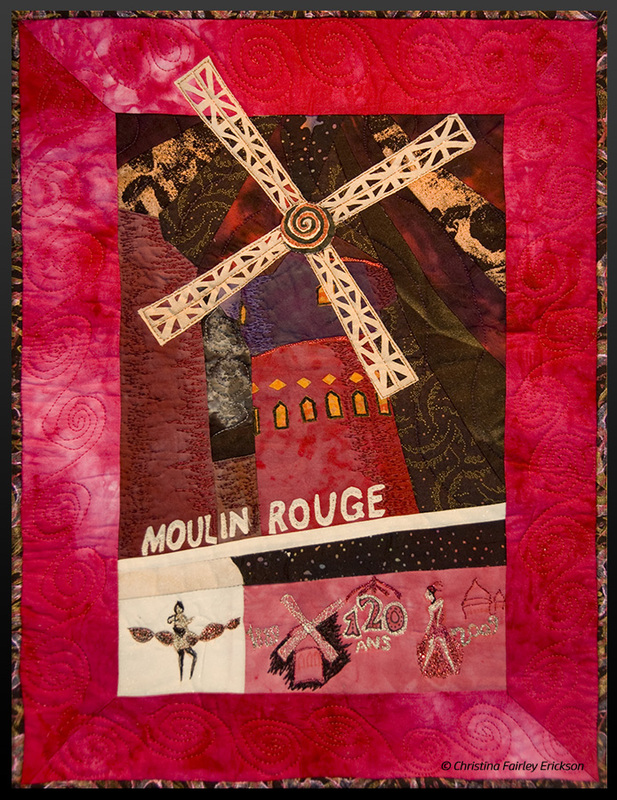 With quilting being such a traditional woman’s art, some feel it’s taboo or at a minimum quite a dichotomy to explore the risqué. This image is of the exterior of the famous windmill at night, from a photo I took in 2009 (yes, I went inside too!). The reader board image of “120 ans” is celebrating the 120th anniversary of continuous operation of the infamous nightclub. Materials and Techniques: Hand-dyed and commercial 100% cotton fabrics, freehand machine embroidery and quilting. Original design from photos by artist.